Management of exponential data growth continues to be one of the great challenges for IT managers in light of shrinking IT budgets and environmental concerns. Tape storage is indeed alive and is the key to success in meeting the data growth challenge in a reliable, cost effective and environmentally safe manner! Studies show that the total cost of ownership of LTO 5 tape systems is 15X less than disk for long term data archives while disk consumes 238X more energy to store the same amount of data. Tape systems have further advantages such as greater capacity with potential density increases, better reliability, ease of removability and scalability, and support of WORM and encryption. With LTFS (Linear Tape File System) making tape faster and easier to use, tape is truly the ideal solution for long term data storage, now and in the future! As database- and Internet-related applications require greater data storage, and critical operations demand minimized downtime due to backup operations, new cost-effective solutions are needed. The Fujifilm LTO Ultrium 6 cartridge is the first in the world produced with Barium Ferrite magnetic particles using Fujifilm's core Nanocubic technology. 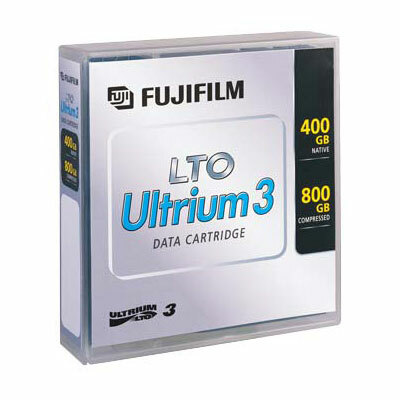 The LTO Ultrium 6 cartridge offers a super high compressed (2.5×) storage capacity of 6.25TB with the transfer rate of up to 400 megabytes per second. LTO Generation 6 hardware will be backward read/write compatible with LTO Ultrium 5 data cartridges and backward read compatible with LTO Ultrium 4 data cartridges. As with the previous generation, LTO Ultrium 6 hardware will incorporate the Advanced Encryption Standard (AES) and Linear Tape File System (LTFS) dual partitioning functionality. In addition, Fujifilm LTO 6 cartridges are capable of long life archive for over 30 years and it also has excellent read/write accuracy on drives that start to wear down after repeated use. Nano-dispersion Technology: Uniform particle dispersion by applying high-dispersed binder. Nano-coating Technology: Improved ultra-thin layer coating to realize an even thinner magnetic layer. Excellent read/write property: By adopting Barium Ferrite, Fujifilm LTO6 tapes have higher coercvity, lower noise compared to older generations. Over time the recording head of a well-used drives start to wear down leading to a drop in performance. However, since Fujifilm's LTO6 with Barium Ferrite, from a system performance point of view, has more margin compared to metal particle tapes (measured using Fuji manufactured tapes), it can be read/written more accurately on these older drives. Long Archival Life: Barium Ferrite is chemically stable (already oxidized) and does not easily get demagnetized by outside energy. Therefore magnetic tape using Barium Ferrite is said to have a longer archival life of more than 30 years based on Fujifilm's acceleration tests. LTO Ultrium technology relies heavily on timing-based, high-precision servo control to achieve its remarkable performance levels. LTO Ultrium data cartridge uses dual servo tracks that have been precisely written along the entire length of each of its four data bands, for extremely fine placement control and redundancy in the event of tape damages. From LTO G4 System, the Advanced Encryption Standard (AES) 256-bit encryption algorithms is introduced to keep data secure. The hardware-based AES 256-bit encryption offers higher level of security during storage and transporting of sensitive information. WORM (Write Once Read Many) functionality provides a cost-effective means for storing data in non-rewriteable format to help address compliance requirements. The library pack protects the cartridges against impact if dropped and provides also added protection against dust and humidity. It's a good and safe storage and archival solution offering easy and quick unpacking, carrying and piling.